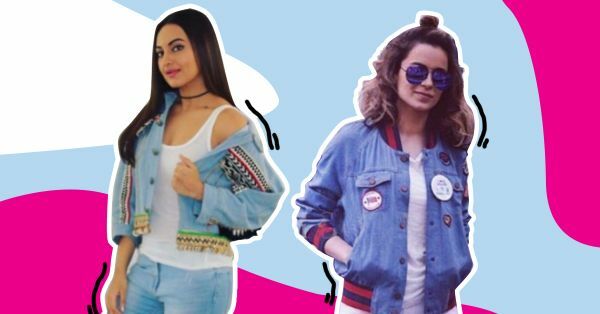 10 Amazing Ways To Wear The Denim On Denim Trend! 1. Separates for the win! Beat the heat by sporting these super cute denim separates! Denim co-ords are in this season and Alia Bhatt is giving us major style goals! Her tie-up crop top is SO cute and we are in love with the flared pants. And for those of you who don’t wanna show much skin, carrying a jacket or a shrug would definitely help! 2. Mix ‘em trends up! Why stick to one, when you can have the best of both worlds? Yes ladies, this clearly stands true for this super cute look. Instead of wearing your flared denim skirt with a simple top, try pairing it with an off shoulder denim top (or you could also wear your shirt as an off shoulder top). This way you could incorporate both your favourite trends in one look! 3. Basics be the best! For days you have nothing to wear, this basic denim on denim look will come to your rescue! We love how Priyanka Chopra is wearing her basic denim shirt with a pair of fitted ripped jeans. Looks so cool, right? 4. Keep the colours different! Take lessons from the queen herself on how to nail the art of denim dressing. Don’t you love the combination of white denim jeans and blue jacket? We do too! The point is to keep a variation in colours of denim, so as to make the outfit look more attractive! Don’t like the denim on denim trend much, but still wanna give it a shot? Well, this look is just perfect for you. All you gotta do is wear a denim dress and tie up your denim shirt around your waist. Try choosing your dress and jacket in different shades of blue to stand out. No one does fashion better than Sonam Kapoor and she has proved it yet again! 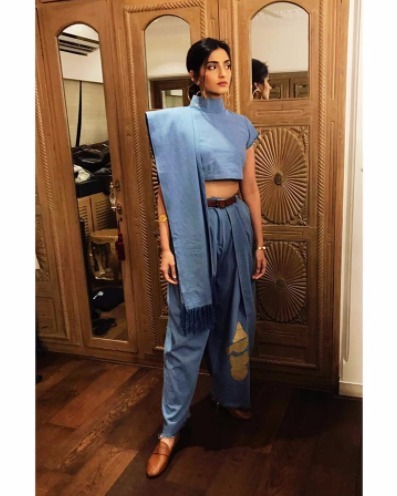 This denim saree is the most unconventional denim on denim look we have seen so far and it’s absolutely amazing! Would you dare to wear this look? 8. Keep it fitted and short! Nobody does punk fashion better than Bella Hadid. The supermodel sure knows how to keep it hot and sassy at the same time. We love how she has balanced the proportions of her outfit by wearing a fitted pencil skirt with a denim jacket. You should definitely give this look a shot too! 9. Wear a dress over it! Take cues from the stunning Aditi Rao Hydari on how to style denim on denim differently this season. 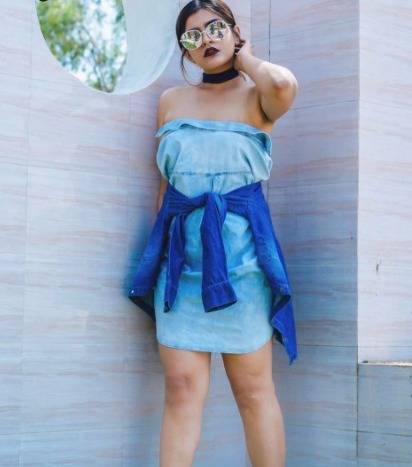 She has worn a washed denim shirt dress over a pair of denim joggers and we just can’t get over how cool and comfy this look is! We are gonna try this definitely, will you? 10. Oversized jacket + shorts = LOVE! Someone please call the fire brigade as this outfit has literally put us on fire! We absolutely love this combination of oversized jacket and denim shorts - just.SO.hot! Just pair them up with a pair of biker boots and you’ll be good to go!